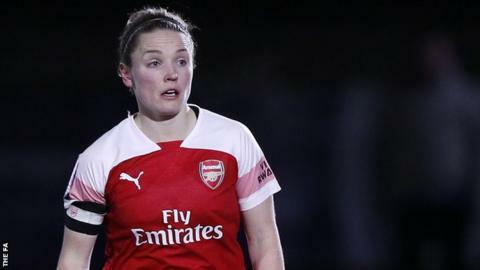 Kim Little scored twice as Women's Super League title hopefuls Arsenal battled past bottom side Yeovil Town. Yeovil, who have lost 13 of their 14 league matches this season, produced an impressive defensive display to keep it 0-0 until the hour mark. But Little's deflected strike broke their resistance, before Beth Mead's looping effort doubled the lead. Little made it 3-0 from the spot after Mead was fouled, ensuring the Gunners stay two points behind Manchester City. But Arsenal, who had lost two of their previous four WSL matches, have two games in hand on City and the title is still in their hands. Yeovil, meanwhile, are edging closer towards possible relegation - they are now three points adrift at the bottom of the table, have played a game more than Everton who sit directly above them and their goal difference is the worst in the division. Match ends, Arsenal Women 3, Yeovil Town Ladies 0. Second Half ends, Arsenal Women 3, Yeovil Town Ladies 0. Beth Mead (Arsenal Women) wins a free kick on the left wing. Offside, Arsenal Women. Daniëlle van de Donk tries a through ball, but Beth Mead is caught offside. Attempt blocked. Hannah Short (Yeovil Town Ladies) right footed shot from the centre of the box is blocked. Assisted by Nicola Cousins. Substitution, Yeovil Town Ladies. Amy Goddard replaces Charlotte Buxton. Attempt blocked. Beth Mead (Arsenal Women) right footed shot from outside the box is blocked. Assisted by Kim Little. Attempt blocked. Amelia Hazard (Arsenal Women) right footed shot from the left side of the box is blocked. Corner, Arsenal Women. Conceded by Rachel McLauchlan. Attempt blocked. Beth Mead (Arsenal Women) left footed shot from the centre of the box is blocked. Assisted by Daniëlle van de Donk. Corner, Arsenal Women. Conceded by Emily Donovan. Corner, Arsenal Women. Conceded by Megan Walsh. Attempt saved. Katie McCabe (Arsenal Women) left footed shot from outside the box is saved in the bottom right corner. Substitution, Arsenal Women. Amelia Hazard replaces Katrine Veje. Substitution, Arsenal Women. Ava Kuyken replaces Vivianne Miedema. Attempt saved. Vivianne Miedema (Arsenal Women) right footed shot from outside the box is saved in the top centre of the goal. Assisted by Katie McCabe. Attempt missed. Katie McCabe (Arsenal Women) left footed shot from the left side of the box misses to the right following a corner. Corner, Arsenal Women. Conceded by Hannah Short. Attempt missed. Rachel McLauchlan (Yeovil Town Ladies) right footed shot from the right side of the box misses to the left. Assisted by Charlotte Buxton. Goal! Arsenal Women 3, Yeovil Town Ladies 0. Kim Little (Arsenal Women) converts the penalty with a right footed shot to the bottom left corner. Nicola Cousins (Yeovil Town Ladies) is shown the yellow card for a bad foul. Penalty Arsenal Women. Beth Mead draws a foul in the penalty area. Penalty conceded by Nicola Cousins (Yeovil Town Ladies) after a foul in the penalty area. Attempt blocked. Beth Mead (Arsenal Women) left footed shot from a difficult angle on the left is blocked. Goal! Arsenal Women 2, Yeovil Town Ladies 0. Beth Mead (Arsenal Women) right footed shot from the right side of the box to the bottom left corner. Assisted by Katie McCabe. Substitution, Yeovil Town Ladies. Emily Donovan replaces Ann-Marie Heatherson. Attempt blocked. Beth Mead (Arsenal Women) right footed shot from the left side of the box is blocked. Assisted by Kim Little. Hannah Short (Yeovil Town Ladies) is shown the yellow card for a bad foul. Lisa Evans (Arsenal Women) wins a free kick in the defensive half. Foul by Vivianne Miedema (Arsenal Women). Hannah Short (Yeovil Town Ladies) wins a free kick in the defensive half. Goal! Arsenal Women 1, Yeovil Town Ladies 0. Kim Little (Arsenal Women) left footed shot from the centre of the box to the bottom left corner. Assisted by Katie McCabe. Substitution, Arsenal Women. Katie McCabe replaces Janni Arnth. Attempt saved. Vivianne Miedema (Arsenal Women) right footed shot from the centre of the box is saved in the centre of the goal. Assisted by Dominique Bloodworth. Attempt missed. Leah Williamson (Arsenal Women) right footed shot from outside the box misses to the left. Assisted by Beth Mead.